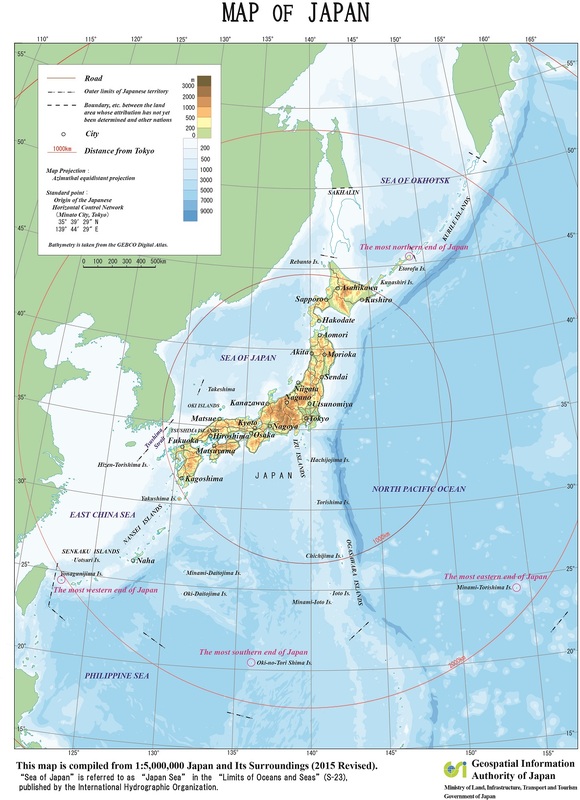 Geospatial Information Authority of Japan (GSI) determines the location of territory of Japan on Earth by means of surveys, and develops maps that clearly show the territory. GSI develops several kinds of scaled maps of the entire territory of Japan, including detailed "1:25,000 topographic map". Also, in order to ensure that territory of Japan is accurately understood both within Japan and overseas, we have developed a map that condenses the whole territory onto a single sheet entitled "1:5,000,000 map of Japan and its surroundings" (Japanese and English versions are available). Everyone can view and obtain these maps that GSI has developed through GSI homepage or in general bookstores, etc. The names of Japanese islands in English are to be composed of "the island's name (Japanese names in Roman characters notation)" and "Island". However, this does not apply when another English name is in use in treaties or other official documents. The following are examples of islands' names which are already used in treaties or other documents. Other examples are to be added in the future. Users can browse maps and aerial photographs developed/taken from the past up to the present, including "1:25,000 topographic map" and a "1:5,000,000 map of Japan and its surroundings", etc. It is possible to obtain a complete map of Japan in A4 size developed from the "1:5,000,000 map of Japan and its surroundings".